Knights & Dragons is a non-stop action role-playing game with endless battles against mythical monsters in one massive action-packed adventure. The Dark Prince has unleashed his savage beasts on the land, and only the most elite knights can rise to challenge them. Build your team of heroes and recruit online players to battle monsters in the ultimate fighting force! Clash with legendary beasts in deadly, fast-paced combat, and loot rare treasures to fuse mighty weapons and impenetrable armor! NEW FEATURE Collect heroic pets to fight alongside your knights! Collect, train and upgrade elemental companions to aid your knights in battle. Pets can boost your attack stats, increase your defense and improve your abilities! Use bait in the hunting grounds to attract rare pets, then level up and fuse them to create the ultimate battle companions. Assemble your team and embark on an epic quest to defeat evil in this never-ending war of light and dark! Embody the Knight Commander – build a team of epic heroes and engage enemies in role-playing combat, fighting with powerful weapons and deadly abilities. Lead your brave team of knights through treacherous dungeons, hideouts and perilous dungeons in search of powerful loot. Annihilate The Dark Prince’s fantasy monsters and usher in the dawn of a new era. Use powerful Massacre skills to turn the tides of war! Recruit pets to aid your knights in battle. Level up your companions to boost your team’s stats and increase attack! Form an alliance with other players and fight alongside your guild members to advance the story together. Alone you are knights, but together you become kings! Every week brings new chances to clash with knights and win glory for your guild! Challenge the PvP thrones in real-time role-playing combat to become kings, but beware – it’s treacherous at the top. Enlist unique knights for your city’s cause! Bring gold and loot back to your castle in exchange for rare items that will help you repel the dragon scourge! Use fusion to craft five types of elemental armor at your castle, or fuse ultra-rare Dragonforged armor to become an unstoppable destructive force. Crush the Dark Prince with friends, or challenge enemy clans in PvP. Your enemies may be dangerous, but the risks are well worth the rewards in this epic story of heroes and monsters. 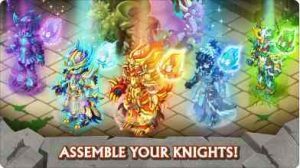 Download Knights & Dragons to become a hero today! This game really isn’t pay to win. Chests are such a small part of this game that it can’t be pay to win. If you watch ads and build up gems, you can go on pushes that get you armors that are better than the ones in the chests! Just don’t buy chests lol. For all those whose ads don’t work, there are things like resetting advertisement tracking in your device settings, or uninstalling/reinstalling etc. but for those players who can get gems, just save, and it’s no longer pay to win at all. You have to figure out how to play the game right, and how to actually get good armors before it becomes fun. It’s a great game that deserves more time than you instant gratification hogs.